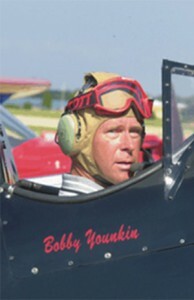 Bobby Younkin had flown aerobatics since he was 16. He realized in his very first solo flight that he could do it, using the skills he had already learned flying radio controlled model planes. “I just had to orient myself to being in the air instead of on the ground watching,” Bobby said. Later, he honed his skills under the guidance of world famous aerobatics pilot Duane Cole. Every year, Bobby performed at air shows throughout the nation. The Arkansas native considered himself a working class pilot, relying on the skills he had needed to succeed – daring, ingenuity and hard work. Bobby gave audiences their money’s worth with his fast-paced shows. His acts combined continuous action and tight control with high-powered smoke and noise to deliver a performance that kept all heads turned up. Bobby’s latest act was a Learjet 23, an aircraft never intended for aerobatic use. Designed as a corporate jet, the Lear was built to haul wealthy clients around in comfort and style. He had to receive special approval from the FAA to fly the jet in air shows, approval based on his track record as a pilot. Bobby pushed the aircraft to its limits by performing a full aerobatic routine in his Lear, the ninth one ever built. The Learjet’s acceleration and climb made it the highest performing air show plane in civilian hands. Bobby delivered a smooth, graceful show while keeping the jet in close proximity to the crowd. The sleek craft, painted a high-gloss red and black, reaches 400 mph and soars 6,500 feet above the earth during Bobby’s performance. Two turbo jet engines produce 2,850 pounds of thrust each. 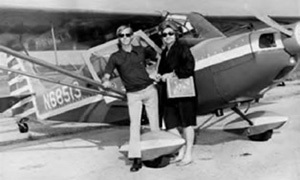 Bobby’s shows are unique, said John Cudahy, president of the International Council of Air Shows. 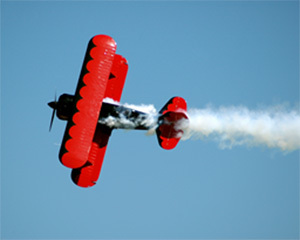 The pilot has both factors needed to make an air show act stand out – quality of showmanship and expertise as a pilot. Bobby, 49, grew up in an era when pilots expressed their personalities through their planes, modifying aircraft such as the Stearman and the Chipmunk for aerobatics. The emphasis on individualism made an impact on Bobby. He has carried the tradition on with one-of-a-kind planes of his own. “You know you’re onto a good air show act when everyone starts telling you you’re crazy,” Bobby said. That happened when he bought the Learjet and it happened with an earlier air show success – a Beechcraft Model 18. Bobby had had the idea some time ago, while flying freight in a Twin Beech, to use the aircraft for aerobatics. In 1989, he found just the right one and modified it for show. 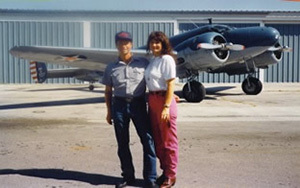 Bobby achieved national success with the Twin Beech. He followed that up a few years later flying SAMSON, a replica of the famous 1940’s air show plane built by Curtis Pitts. Steve and Liz Wolf’s recreation is “overly blessed with power,” Bobby said, delivering a big show. 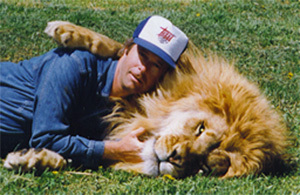 Bobby bought an African lion cub a few months after launching his act in SAMSON. The cub had the same personality as the biplane – big, loud, and aggressive – so Bobby named the lion after the plane. Samson the lion lived with Bobby and his family near Springdale, Arkansas. The big cat flew once, when Bobby brought him home as a cub, but since that time the lion has remained grounded. Bobby has performed in hundreds of air shows from coast to coast and has logged more than 15,000 hours in his 30-year career. He owned a charter business and airfreight service as well as performing aerobatics. Although sometimes Bobby wished he could trade the cockpit of his performing plane for the seat of a ride-around lawn mover, being in the sky brought a pay-off nothing can match.